Nintendo's enjoyed some success with amiibo so far, amassing millions of sales and seeing demand remain sky-high on the Super Smash Bros. range, to the point that it's struggling to provide enough stock of specific rare figures. In March we'll see the Super Mario range join the ranks, of course, but it seems that there may be even more variations on the way. 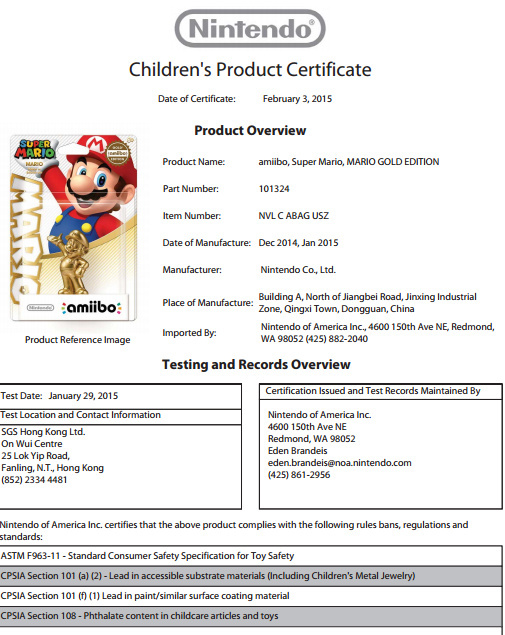 Some intrepid web users have been scouring un-publicised Nintendo web pages, it seems, and have come across 'product certificates' for special Gold and Silver editions of the Mario amiibo in the upcoming Super Mario range. Dated for 3rd February, they apparently demonstrate that product testing was taken in late January; you can see screengrabs below. Unsurprisingly the web pages in question are now returning 404 errors, and until Nintendo announces these figures they remain a rumour. It's not beyond the realm of possibility that Nintendo is planning even more amiibo variations, of course, though the reaction to these would potentially be mixed, not to mention the argument that Nintendo should sort out existing stock levels before introducing more figures. If this proves to be real, what do you think? Let us know, as always, in the comments. I hope these come to Europe. Also, a rumour is suggesting these are Club Nintendo rewards. It'd make sense, after the survey on amiibo. I want a Golden Toad. Words cannot describe how much I want those. @Inkling That'd be nice. I'd really like a golden amiibo of a franchise I actually enjoy, though. What's next, a pink gold Peach? inb4 eBay sellers buy 10 each ands sell for 4 times the original price. Also, more Mario Amiibos? While I'm having trouble finding Captain Falcon? AAAAAAGH! I want them both, but I can already tell that they'll be out of stock before I'll even get the chance...crap. I want Toon Links in each of the 4 swords colors. NOPE. Done. I'm not buying these things anymore. They want to keep showing off new Amiibos, but they don't want to bother shipping a reasonable supply to stores. I'm not wasting my money on these things. Back to buying Transformers. Which are a million times more fun anyway. Proper Store Exclusives, or Final Club Nintendo Elite Status Reward? Whichever the answer ends up being, getting both will not be pretty. Meh. I think I'll get the regular one. Now we need a color variation for each of the Yoshis. Gold Mario I get after the coin heavy 3DS game, but silver looks odd. It'd be nice if these were for Club Nintendo Elite members, but they already said that the rewards (due to be announced in April) are digital games. And if they put these out as regular rewards, they'll tick off a lot of people who spent a lot of their coins thinking the ones that went up this week were the final offerings. I think these should be elite status rewards, but I doubt they actually will be. Instead, we'll get our choice of a few bargain priced titles that haven't sold very well. Well this can only be described as a cash-grab. Forcing those who wish to own the complete set to purchase the same figure 3 times (when 4 of them function the same as Smash Bros variations, so 4 times...) is a brutal move. I'd only buy them if I didn't have the regular version of it already. Since the only one of the SM collection I'm getting is Toad, which I have on pre-order, they'd best get a move on if they want me to cancel my order and buy gold instead. I.. honestly don't know what to think of these. @sinalefa I would love that actually, certainly more than these gold/silver Marios. I'd buy every single Yoshi color. Maybe even twice. These would be great Club Nintendo platinum awards, indeed. I'm done with trying to hunt these things down. If I come across ones I don't have, that's great, but I'm not going out of my way to ensure I get these things anymore. Between the stock shortages, low manufacturing rates, awful distribution, cancellations, and Ebay vultures snatching up the entire lot, there's no point anymore. So, go ahead Nintendo, make some super rare gold and silver Amiibo. Your loyal fans will never every get a chance to obtain any of them with how you handle practices. Club Nintendo rewards would be fine, but other than that? HAIL NO! Why all the emotions over a rumor that could just be a big lie? The rumors better be true. I've been dreaming of a Gold Mario amiibo for quite a while. Unlike all the other custom amiibo out there this one seems rather easy to duplicate. All you need is a can of metalic gold/silver spray paint. I wan- No- I NEED THEM! They're something I would treasure indeed. The stuff golden spray paint can do to people is amazing and sad at the same time. Looks nice, though I'd rather have alternate costume amiibo like Female Robin and Villager. Unless Nintendo gives them for free to club Nintendo users, I don't care. I don't need a golden mario in my life. Smash mario is good enough for me. Also I won't be buying any duplicate characters unless they are in an amazing new pose, or look drastically different. For example, I would totally buy a metroid prime/super metroid styled samus. But these new mario amiibo? The smash ones look so much cooler than most of them. Now All we need is for them to make a Pink Gold Peach Amiibo.. I like the idea by the way, of it being a last hoorah for Club Nintendo. No coins needed to be spent to get one, you get the gold if you hit gold status, you get the platinum if you hit platinum status. Eh, I don't much care for the character Mario anyhow, so not much bothered. I don't particularly care for these, but I'll be disappointed if they unlock things that regular Mario wouldn't. I'm already spending too much on Amiibos as it is to think about these variations. Inkling - I 100% agree with you. Lets see. A franchise whose movies basically killed the franchise's soul. Definately want to buy more robots. It's quite annoying that they haven't made enough of their current lineup but are already planning new ones. It's totally giving their loyal fans the finger. Id want a codename steam line with Abe Lincoln. @sinalefa And Shy guys why stop when you can have an extra 8. I really doubt they'll be Club Nintendo rewards. Only way would be if they were for Elite Status which has been said will just be digital. It's also quite odd that these had two months of production while the rest of the Super Mario amiibos only had 1. Really done with Nintendo's Amiibo crap. Nintendo apologists are keen to absolve then of any wrong doing, but this is all Nintendo. Supply manipulation, hype machine… marketing ploys are fine if they are handled well. The Amiibo mess is a crock of crap. And now variants? Scalpers and the secondary market haven't screwed Nintendo fans enough? Where games have content only unlock-able by Amiibo, it's nothing more than extremely expensive DLC. Think of silver as Metal Mario. Now you have a reason to buy. Hurry up and buy! This does seem like it could be the Platinum reward for Club Nintendo. Maybe silver is really platinum level and gold is for gold level. Oh god... If these come to Club Nintendo's last hurrah prizes all is forgiven. I don't even care if I don't get them, I'll take back every damn thing I have ever said against them. It was only a matter of time. My greatest fear about these things was color variants. You know these are going to sell out like crazy. If you're a serious collecter, this is how they murder your wallet. Maybe they're Super Mario Bros 30th aniversary Mii's. @Tsusasi While I agree that the limited stock and exclusives is a huge mess, I don't mind variants. Functionally they are the same, and no one is forcing anyone to buy every amiibo and every variant. Its kind of cool to just have different options for each. That's what I think anyway. For everyone saying they can't possibly be Club Nintendo rewards because it has long been confirmed...why can't this just be a surprise? No coins needed to be spent, just status reached. Now all hell will break loose... On eBay. @Quorthon Shipping a "reasonable supply" doesn't fix the scalper issue - they just buy more of them. The scalper issue is the retailers' problem. They should be trying to prevent scalpers from doing this, and they either aren't or they're doing a half-baked job. Nintendo can't do anything about the scalpers as they ris- no, will piss off the retailers if they try to impose restrictions. They're not on good terms with them as it is, and they can't afford to make it worse. All Nintendo can do is ship more out for the scalpers to buy. I want Pink Gold Peach. Even if they give you the option to buy Gold and Silver Mario if your a certain status on Club Nintendo I'd be satisfied, I want both damn it. Kind of glad I held off getting a Mario Amiibo if this is true. I think the better idea is to start covering the Mario Amiibo plastic with some sort of foil and those few lucky people that find a gold Mario inside of it get to take a trip to the Amiibo factory and meet Willy Moto. I'm only interested in these if they are final Club Nintendo awards. Taking an existing mold and slapping metallic paint on it wreaks of a cash-grab. btw, in North America, GameStop.com has the Mario Party 10 bundle w/ Mario amiibo and the other Super Mario Edition amiibo available for pre-order! My immediate thought when I first heard this news was a very stern "Nintendo, NO." No doubt this is real, but question is, just how are they gonna distribute them? I think it's SUPER wishful thinking that these are gonna be Gold/Platinum CN prizes when it's already been said that they're gonna be digital games... but that sure would be an awesome way to go out with a bang! If they DO happen to be CN prizes, I believe they're gonna make it much more of a challenge to obtain them. Like, "Have been a member of Club Nintendo since 20XX and have reached Gold/Platinum status X amount of times." With everyone cashing in their coins now, I highly doubt they're gonna just reward 2014-2015 G/P members. Can't say I wouldn't buy them, but they definitely should sort out other stock issues first, before introducing these. I wish they'd done this with all those leftover Mario, Peach, and Luigi amiibo. Spray them with metallic paints, slap 'em on a Mario stand, and reuse them. The unsold amiibo are just wasteful, otherwise. They could be the final farewell for Club Nintendo! It's probably wishful thinking, but I can dream. Can't even get the Amiibos I want as it is, this is just ridiculous. After my Toon Link comes in the mail I'm done trying to hunt these things down. If I come across one that I don't have and want, that's fine, I'll get it. But as for breaking my back trying to hunt these things down, I'm done. Nintendo can't even get the existing stock right, and now they're feeding scalpers with these gold and silver versions. After the debacle with trying to get a copy of the limited edition Majora's Mask and the MM New 3DS it's just too much. Nintendo needs to step it up if it wants me to even consider this stuff again. If Nintendo has any brain they would give these out for Platnium status rewards or even gold status as its the last club nintendo gift. They would get so much fan appreciation towards them if they were to give these as rewards. I am praying that this will happen as I reached Platnium status every year for the past 5-6 years but always forgot to choose a reward until last year which sucked royally. I was lucky to get a Majoras Mask Bag with my points but I would have a heart attack and jump for joy if this is what we get for elite rewards this year. PLEASE NINTENDO DO THE RIGHT THING FOR ONCE, give the exclusives to your most loyal fans and not the scalpers. Club Nintendo's website (at least in North America) had a page stating the platinum/gold rewards would be digital in content and be listed on the same page as last year's (with the new ones being swapped in). It would be awesome, but won't happen. Nintendo is going to use these as $$$ makers. Likely low item prints to make people desperate to keep picking up every new release. That is also why Mario is listed as Silver, rather than platinum which would make sense if they wanted to make them into the rewards. @Quorthon buy the entire lego city collection. That should keep you occupied! Whoever first started the re-skinning trend in game development should be deemed a failure. Feels like it is such a low budget disgusting quick fix for things that should have effort put into them. I'd like a silver mario to use as a hood ornament. 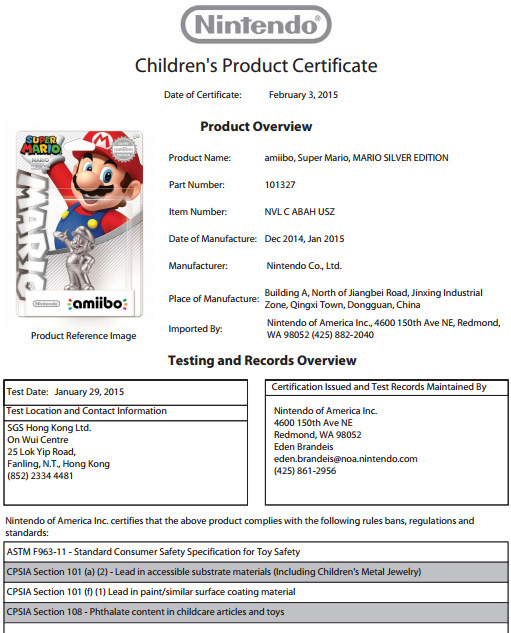 It seems Nintendo won't be satisfied until someone gets seriously hurt (or worse) over an Amiibo. Oh, I didn't know it was actually labeled as silver- I thought that was just observations. @DiscoGentleman 1 as in "It's a priority! ", 10 as in "Bottom of the list". We listen to you, thanks for taking part on this survey. But, seriously? Silver? That's Metal Mario, I want! Edit: ouch, I've just read it says "Imported by NoA", sigh... Come on Ninty, give us something worthwhile to order on co.uk with our stars! I'm only interested in the "Super Mario range edition". The more choice, the better though. @andrea987 The imported by NoA situation probably confirms it to be Gold/Platinum rewards, a system that unfortunately wasn't brought over to Europe. Will this be worthy more than real gold statuettes? Gosh WHY!! WHY MUST YOU DO THIS TO ME!!! I have a hard enough time trying to convince my wife that we mustn't pay the energy bill yet, but buy these amiibos. Now they come out with these! Good bye cell phone bills (which in turn...good bye cell phone service ). Unless it allows me to have a permanently Metal Mario opponent like in 64, I'm not interested. @andrea987 I know right? I have loads of stars left! I honestly see these things taking off in 3 - 5 years, and not just w/ the NRA, but w/ collectors of all kinds. I grew up w/ all those sniffable glue models - Incredible Hulk, Godzilla, Planet of the Apes - I can certainly see people printing out individual parts and gluing them together, or just printing out single figures and painting them. When I was a kid my uncle melted down lead - yes the poisonous metal - in our asbestos covered basement and poured it into little army men molds that we then played with. As much as I like playing video games w/ my kids I could have had a lot of fun w/ 3D models. Hopefully they'll get their chance w/ the 3D printers. Sniffing model glue while playing w/ lead toys in an asbestos covered basement sure does explain a lot. @odin6786 Yes, forcing them. Sure no one HAS to buy them but there are of course people who are trying to buy the complete collection for reasons only they could explain. People would feel the need to buy each in gold and silver in order to say they have a complete collection. Why isn't Luigi the silver one? Why make both Mario? Sorry Nintendo.Until you can supply enough for everyone I'm done with amiibos.